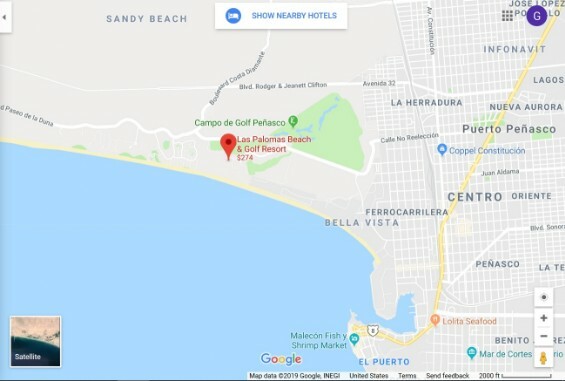 The BEST Resort in Rocky Point. The Place To Be! The Links at Las Palomas Golf Club is a spectacular 18-hole par-72, seaside golf course. Situated along Sandy Beach on the shores of The Sea of Cortez. The terrain resembles that on which golf begun more that 600 year ago. The Las Palomas Golf Club also features a practice range, clubhouse and Golf Shop. Play through an obstacle course of hillocks, lagoons, and natural bunkers with exciting panoramic views of the Sea of Cortez. Las Palomas Beach & Golf Resort. At Las Palomas Resort The Links Golf Club is a spectacular 18-hole par-72, seaside golf course.